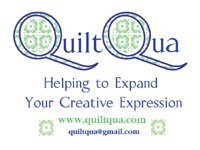 I'm in the mood to catch you up on my quilting and sewing year. I have been so quiet here and I miss it. Therefore you get the brunt of the backlog of posts, er, I mean, I am just sharing what I've been up to. One of my goals in life is to have 2 seasonal wall hangings for each holiday or season. One smaller for the kitchen area and one larger for the family room. Last year, I blogged about my Rainbow Trail small wall hanging. Here's a reminder. I decided, oh, maybe on March 13, that making the larger wall hanging would be good for the upcoming St. Patrick's day. I took leftover fabrics from the Rainbow Trail quilt and created a simple top. Since we had a rainbow with sparkles throughout, it only made sense to applique a pot of gold. I then let the quilting speak for the quilt. Silly shamrocks on the outside borders. Baptist fan in the rainbow give it a full rainbow feel and arches of thread coming out of the pot to provide a shine effect. Lastly, a 70s-ish beaded curtain style meant to reflect rain drops. It kind of looks like spoons but the effect is cool so I don't care. In case you are wondering, it did not get completed until the end of the day on March 17. But, it got done! Supet cute Beck! Love the quilting. Love the rainbow effect. Very cool. Pillows,pillows, who's got the pillows? Did I show you Mom's tote?